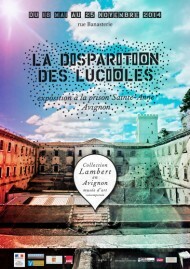 The year 2014 marks a watershed for the Collection Lambert in Avignon. Indeed, so as to offer an exceptional home to the important donation made by Yvon Lambert to the French state, comprising 556 contemporary artworks, the Collection Lambert must close its doors to the public until the summer of 2015 during the site's extension. The museum staff decided to take advantage of this imposed closure to pursue a unique, important project combining contemporary art, retrospection and the showcasing of heritage. Thus was born "The Disappearance of the Fireflies", an ambitious project beginning in late May 2014 and housed at the Sainte-Anne Prison. This emblematic heritage site for the town of Avignon, located behind the Papal Palace, this edifice – closed a decade ago – is a rare example of a purpose-built prison dating from the end of the 18th century (rather than representing a reconverted convent, hospital or military barracks). The Collection Lambert will occupy the cells, corridors and certain courtyards of the prison, to exhibit works from the prestigious private collection of Enea Righi. The title is borrowed from the famous text published by Pasolini in 1975 in the Corriere, which will impregnate visitors' entire collection tour; indeed, this exhibition is meant to be a sensorial experience in which the memory-steeped locations and their hosted artworks will come together and interact in the manner of the Italian director's beloved fireflies. The theme of "imprisonment" will naturally be evoked, as well as "the passage of time", "solitude" and "love". So as to maintain an intense and meaningful dialogue between the edifice and its housed oeuvres, the decision has been made to leave the Sainte-Anne Prison unaltered. Exhibited within its cell, each work of art thereby becomes a firefly, a poetic element of soft resistant light, offering spectators the possibility of experiencing a novel experimental field. This ambitious project will be complemented by a rich cultural events programme. Video projections, readings, performances and encounters linked to the exhibition and the site's history will be organized throughout the length of the exhibition, while educational projects will also be organized for schools and for associations active in the prison environment. A first extensive collaboration will be initiated with the new team of the Avignon Festival. An exhibition catalogue will be released in partnership with the publishing house Actes Sud, with texts by Philippe Artières and Georges Didi-Huberman.